Good ATRAC3+ player and software. Stylish looks and appears well made. Excellent sound quality for what it is. Very poor MP3 player with equally poor software. Sound spoilt by artefact in playback sound. Plastic scratches too easily and not as well made as it looks. Though my family all have MP3 players this is my first one and was purchased to replace a Sony Professional Cassette Walkman which isn't very portable but sets my gold standard in sound quality. The NWE95 is well made and for something so diminutive performs well. Though not of audiophile standard it is not far off being able to run through a HiFi system producing an acceptable sound. It will not in the end replace my cassette player as it is still inferior to this. The player is stylish and looks well made but is let down by the poor clear plastic cover which scratches even with careful handling. For those that like to keep their HiFi etc. immaculate it will disappoint as it will look used fairly quickly. 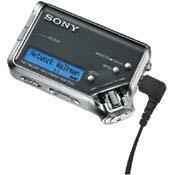 The NWE95 is best used with ATRAC3+ and SonicStage though it is said to play MP3 music files. Though ATRAC3+ does sound less dynamic and appears to not have as much bass and treble it sounds better on long term listening. MP3 sounds initially impressive on the player but becomes tiring to listen to. The MP3 software also appears as an afterthought compared to SonicStage and reminds you of Windows 3.1 explorer. Also for audiophiles MP3 tracks play with an annoying background clicking noise which is independent of volume and very noticeable when the display is lit and you are playing quiet tracks. It sounds a bit like crickets in the jungle and once you have heard this artefact you cannot miss it. With ATRAC3+ it is not present at all. For me MP3 is unlistenable because of this but SonicStage can convert MP3 to ATRAC and produce a good resulting conversion. I use a 256 bitrate which limits the player to the equivalent of 4 CDs. A 64 bitrate however is still okay and the difference in quality between the two is not that great, but if quality matters 256 is the minimum. Overall I have not been as disappointed as I could have been nor have I been as impressed. The NWE95 is of good quality but not of the old Sony standards. In the UK it costs GBP100 which is approximately USD175. It is expensive for what it is. If it did not mark so easily and were that bit more durable it would be worth the premium. It is a shame that how it feels is not up to how it looks. Also it lacks a case to just hold the player and protect it yet but have it useable and comes with a pouch of no use. I have compared this to an iPod mini and the Creative Nano.